Warner, widescreen 2.35:1/16x9, pan&scan, languages: English DD 5.1 [CC], French DD 5.1, subtitles: English, French, double side-single layer, 31 chapters, rated R, 99 min., $19.98, street date 3/2/99. Directed Paul Anderson. Starring Kurt Russell, Jason Scott Lee, Jason Isaacs, Connie Nielsen, Gary Busey, Sean Pertwee, Michael Chiklis. In the future, battles are fought by men who have been selected at birth, stripped of their individuality, separated from society and raised with one overriding dictum: kill or be killed. Only a handful reach adulthood. Todd (KURT RUSSELL) is a veteran soldier of numerous galactic conflicts and, having lived by these rules since childhood, is one of the best. Scarred, toughened and numbed by a lifetime of fighting, he stands as the embodiment of Darwin's principle of survival of the fittest. But Todd's glory days are over. Scientific advancement has fostered a new breed of warriors. Their expertise in battle is unmatched; their stamina, unsurpassed; their ruthless capacity for killing-second to none. The best of these next generation human fighting machines is Caine 607 (JASON SCOTT LEE), who, in a government test to demonstrate his superiority, is pitted against Todd and two of his squad members; all except Todd are annihilated. Severely wounded in the fight and assumed dead, Todd is dumped on a remote planet-a garbage outpost-peopled only by a peaceful group of lost and forgotten pioneers. Gradually nursed back to health by the settlers, Todd begins to learn about the everyday aspects of life beyond the battlefield, discovering the humanity in him that was all but destroyed by a lifetime of killing. But when Caine 607 and his new battalion of soldiers attack the outpost, Todd is called to defend his adopted home with the help of the other inhabitants, who set aside their pacifist beliefs to fight for their way of life. Directed by Englishman Paul Anderson (Event Horizon, Mortal Kombat) - not to be mistaken with Paul Thomas Anderson who directed the gem Boogie Nights - and scripted by Academy Award nominated screenwriter, David Webb Peoples (Blade Runner, Unforgiven), Soldier was a colossal flop at last year's box office, taking in a pitiful $15 million that doesn't even begin to make a dent of the $70 million budget. Critics were brutal on the reviews, Entertainment Tonight wrote "A waste-disposal movie in which the garbage of other films piles high into the sky! ", given such negativity, it's no wonder that moviegoers did not march to the theaters to see it. So when Warner released the film on DVD this week, you could understand that it was not high on my list of must review DVDs. But on this particular day, while perusing at the new DVD releases at my video rental haunt, I developed a strong craving for a sci-fi action, and let me stretch the word action. Particularly, I wanted something loud and numbing, testosterone-filled action and explosion to rattle my brain and give my home theater system a heavy workout. I didn't want to be pestered with sci-fi along the vein of Gattaca or even to some degree, Dark City. No lengthy talks, no surprises, just give me the action! In that regard, Soldier delivers. I wasn't bored by the action, nor was I terribly excited, but in the end I was perversely satisfied with a numbing experience. 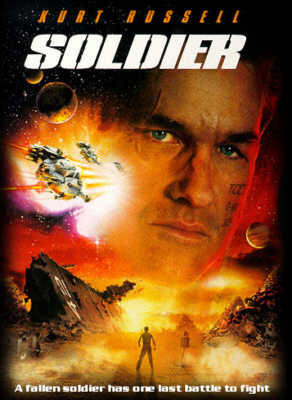 What makes Soldier engaging in part is the casting of Kurt Russell, in contrast to the limited talent and appeal in some action stars such as Jean Claude Van Damme and Steven Seagall, which would give the picture an even less redeeming value. The role of Sgt. Todd certainly doesn't require much acting skills and might be Russell's least challenging assignment, he just needed to act mechanical and merciless in most parts, as the character is trained from birth to kill without conscience. Throughout the entire movie, Russell is only required to utter a handful of sentences. Yet, behind that steely blue eyes evoke genuine emotions and signs of humanity that the viewer could root for, something which a lesser actor would not be able to pull off. As for the action, it can be best described as Rambo style with barrages of huge explosions, fire exchanges with a variety of arsenals and weapons, and capped off with a climactic hand combat sequences. The special effects and production design in creating the garbage planet where Todd is dumped after a near-fatal encounter with Caine 607 (Jason Scott Lee), a new breed of advance soldier, are quite spectacular. It's environmentally hostile with unpredictable powerful sandstorms and littered with mountains of mechanical junks, but carving out a niche are the forgotten shipwrecked settlers, where Todd is welcomed into the community and begins to reclaim his humanity. But the peaceful existance is short lived when the new breed of soldiers descend to the planet and use the settlers as training targets. That's the extend of the plot development and as you can predict, Russell straps on his gears and prepares to kick some butts. Warner rightfully releases the DVD at an attractive price of $19.98 with some extras thrown in to further entice. The special edition is not in the same league as their new Premier Edition, as it only contains a commentary track and a trailer. A "making of" documentary announced in the early press release is scratched. Giving that the movie does not lend itself to further exploration, I've to admit of not paying much attention to the commentary track. At the same time that I was listening to the commentary giving by Paul Anderson, co-producer Jeremy Bolt and co-star Jason Isaacs, I was eating my breakfast, drinking my coffee, and reading the morning newspaper along with my newly arrived subscription of Entertainment Weekly. So excuse me for not able to reveal much on this review, but from what I can recall, their discussion centers on the production design, the special effects, Joe McNeely's score, and most of all, on Kurt Russell. At the least, having three voices on the track did not make it for a monotomous experience. As for the trailer, it contains interestingly enough a number of special effects shots that did not make it to the movie. I wonder how much that added to the bloated budget. Like the movie, the picture quality offers no surprise - that is Warner once again provides an oustanding presentation. The picture is presented at the original ratio of approximately 2.35:1 and enhanced with 16x9 for improve resolution on widescreen sets. Images are finely detailed and smooth, exhibiting none of the jaggy edges and pixelation. On the color schemes, the first half reveals a common, cold blue lighting on the sets that reflects the spartan existance of the military. Once the scene moves to the garbage planet, the picture is saturated with an orangish hue causes by the dusky and twilight atmosphere. In the settlers' camp, the colors and interior design are warm and inviting, in stark contrast to Todd's previous environment. Once the soldiers landed and the mayhems began, we see this clash of blue and orange lighting for the first time. The photographer is David Tattersal, who most recently lensed the highly anticipated prequel Star Wars: Episode One for George Lucas. Colors remain vivid and vibrant throughout the picture, even in the most fiery explosions exhibit no bleeding or smearing. Blacks are bold and solid with well defined shadow details. Digital effects and matted paintings blend in seamlessly to create a visually impressive world. The single layer disc also includes a pan and scan version on the opposite side. Even better than the picture is the encoded Dolby Digital 5.1 soundtrack, where this DVD truly shines. The frequency response is extremely dynamic coming from across a wide soundstage. Sound effects are exaggerated and heightened with outrageous directional effects and clean separation that drop you right in the middle of a fierce battle or a violence sandstorm. The bass is exceedingly deep and powerful through the many explosions, sandstorms, and destructions. The bombastic, militaristic score composed by Joel McNeely (The Avengers, Tiny Toon Adventures) is nearly non-stop right from the beginning credits. As noted in the commentary, the music was recorded where the microphones were placed in a surround field. As such, you can experience the pounding of snare drum, trumpet and horn, and other orchestral instruments distinctively through seperate speakers for a seamless 360° soundfield. Thematically, the score doesn't offer much varieties, except for a song by Loreena McKennitt that McNeel used for a montage. I thought that was inadvertently funny that a McKennitt song should appear in a heavy action film. I would definitely not willing to pay the full price to see Soldier in the theater, but the movie makes for a decent rental, especially when you're experiencing the primitive urge to see things getting blown up. If nothing else, you will get blown away by the demo reference soundtrack. It's a comfortable situation to get what you want. And nothing more. Official Site--Offers a very detailed look into the production with storyboards, sketches and photos. Freebies include poster, screensaver and background patterns. The Los Angeles Times--"In its look, scope and special effects, Soldier is suitably imaginative and spectacular." James Berardinelli's ReelViews--"When it comes to details like plot, character development, and genuine excitement, the film is lost in space." Mr. Showbiz Celebrities: Kurt Russell--An excellent source for profile, bio and credits. Movie Wave--A full review of the original film score composed by Joel McNeely: "The album is less than half an hour long, but is non-stop, pounding action music until the very last cue - and this is hard to take." Amazon.com--Available to purchase are the DVD at 30% off and the original soundtrack composed by Joel McNeely. Reel.com--Purchase the DVD at 30% off.